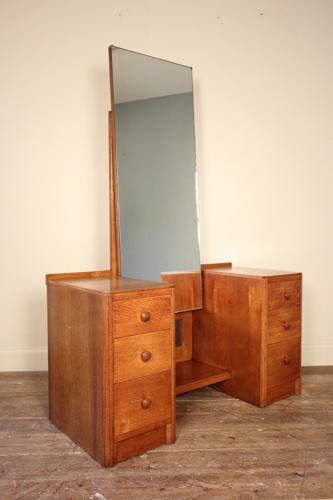 A 1930's immaculate dressing table by Heals of London. Having an arrangement of 2 pillar drawers adjoined by a low shelf and full length dressing mirror, the whole made in light Oak with original handles and mirror plate. Retaining the disc label for Heals. Lovely original condition with good even colour throughout. English, Circa 1930.